How to increase brightness in smaller steps? Is there a way to adjust lighting step ? I have Lenovo L520, and Fn + Light Up or Down adjusts by 20%, how can I adjust the step to 10% ? it will help me fine tune lighting at my dark room. There is a file in Ubuntu which stores numerical integer value of brightness. you will find 3 files in the directory /sys/class/backlight/<VGA>directory replace directory with intel_backlight for intel cards. You will find the max brightness value in max_brightness file and according to that value set the brightness in brightness file. Use xcalib -h for help regarding it's options. As Colin Ian King said, the levels of brightness are hardware related. Some laptop screens have 8 levels of brightness and new ones have 16 levels. On Windows OSes you can change the levels with 1% steps, but they will be rounded to the nearest hardware level. It depends on the screen type. So when you use those shortcuts they call the related command however I could not replace the system inbuilt brightness buttons to use these commands You can use almost any keyboard shortcut button combination you like with xbacklight. The brightness levels are generally under ACPI control with the levels defined in firmware. For example the ACPI control method _BCL "Query List of Brightness Control Levels Supported" informs the kernel how many brightness levels are supported. You can't realistically change this. In my case (Lenovo T500) the problem is, that the brightness regulating key-press is applied twice - once by using the Xwindows, but also independently in the lower level, by kernel's graphic driver itself. So the brightness steps are twice as big as usual. This way it will perfectly work in logged-in X session, unfortunately it will remove the key-press brightness regulation functionality in all other cases (console terminal, X login screen etc). For me xbacklight did not work (EDIT: probably because I did not reboot my machine), therefore I created my own script which uses the built-in gsd-backlight-helper. This script uses smaller steps, especially when the screen is quite dark already. This should output a number. Save the following script in an .sh file, for instance in /home/me/scripts/brightness.sh. 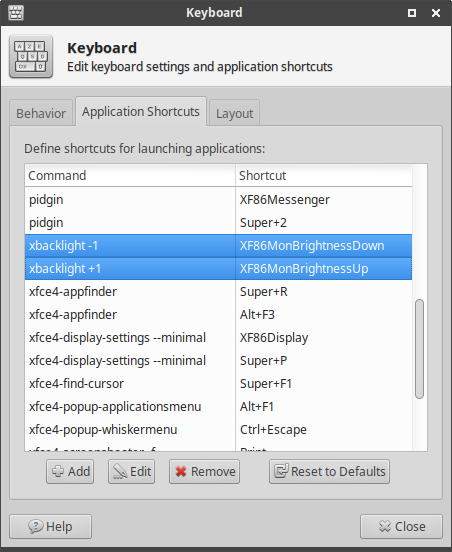 On Ubuntu 16.04, with Intel onchip graphics (i5) under LXQt, it is sufficient to assign xbacklight commands to the brightness function keys XF86MonBrightness(Down|Up) using the global key shortcut settings. These seem to override the defaults even if /sys/module/video/parameters/brightness_switch_enabled is set to Y, while the original functionality on virtual terminals is retained. An alternative to the original xbacklight would be acpilight, but unfortunately this isn't available as Ubuntu package. As it doesn't depend on an X display running, you can also associate it with ACPI button events and use it from the console. Additionally it can store the current brightness on shutdown and restore it on boot. Secondly, check whether you have control over the backlight. Should these commands result in a No outputs have backlight property error, then follow these remediating steps before proceeding. Once xbacklight -1 and xbacklight +1 work from the command line, proceed with assigning these commands to respectively the XF86MonBrightnessDown and XF86MonBrightnessUp keys. This is done by hitting those keys when asked by the Settings → Keyboard → Application Shortcuts application. Finally, reboot for these changes to take effect. Brightness cannot controlled with large precision. I'm afraid that you're stuck with those brightness levels. To be sure, try controlling the brightness using these terminal commands. If you are using Nvidia Graphic card..you can easily use my new method of brightness changing,and edit values in Code.. theres two files and two options within each one. change values of ($value > 0.0) & ( $value2 > 1.1) and see whats happens! inc percent Increases brightness by the specified amount. dec percent Decreases brightness by the specified amount. Hold down Ctrl while increasing/decreasing the brightness. Increases in steps of 1. Not the answer you're looking for? Browse other questions tagged brightness backlight or ask your own question. How do you make the keyboard brightness button adjust at smaller intervals? How do I change the amount by which the brightness increases or decreases? How can I change the percent of screen brightness that changes every time I press the shortcut? Smaller brightness interval when adjusting with hotkeys? Can too low brightness damage my screen? How do I set blue light filter by configuring the Intel graphic card settings?